Anthropologist-historian James Diego Vigil distills an enormous amount of information to provide a perceptive ethnohistorical introduction to the Mexican-American experience in the United States. He uses brief, clear outlines of each stage of Mexican-American history, charting the culture change sequences in the Pre-Columbian, Spanish Colonial, Mexican Independence and Nationalism, and Anglo-American and Mexicanization periods. In a very understandable fashion, he analyzes events and the underlying conditions that affect them. Readers become fully engaged with the historical developments and the specific socioeconomic, sociocultural, and sociopsychological forces involved in the dynamics that shaped contemporary Chicano life. 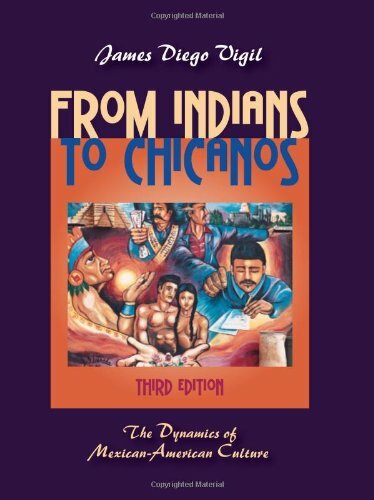 Considered a pioneering achievement when first published, From Indians to Chicanos continues to offer readers an informed and penetrating approach to the history of Chicano development. The richly illustrated Third Edition incorporates data from the latest literature. Moreover, a new chapter updates discussions of immigration, institutional discrimination, the Mexicanization of the Chicano population, and issues of gender, labor, and education. Also by James Diego Vigil and available from Waveland Press: Gang Redux: A Balanced Anti-Gang Strategy (ISBN 9781577666547).